Uglyworld #259 - Ice-Bat Says Bye to Scottish Mum, originally uploaded by www.bazpics.com. Scottish mum flew back to Scotland today from Charleroi airport near Brussels in Belgium. 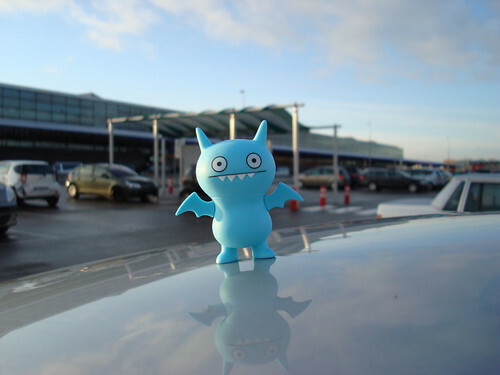 Ice-Bat asked if he could come along for the drive, and once mum was through security to the departure area Ice-Bat flew over the top of the terminal and watched her as she boarded the plane and then started to set up for take off. He tried his best to stay alongside the plane as it made it's way along the runway but eventually had to give up once the plane got really fast. After catching his breath again he flew over to meet me at the car and tell me all about it.